The Secret Life of Walter Mitty, based on James Thurber’s short story, is a property that has long beguiled Hollywood. The idea of escaping one’s ordinary life with fantasy, where we’re the hero. It was turned into a 1947 film starring Danny Kaye, which is rather entertaining, but has yet to be remade in all that time. It’s the kind of attractive project that has attached big name talent at different stages of development, including Steven Spielberg and Jim Carrey. It was never able to get off the ground, that is, until Ben Stiller stepped in, not just as director but also as the lead actor. Given Stiller’s directorial track record, there was suitable reason to anticipate what he could accomplish with Mitty, but the film too often feels like Stiller hamstrung, ably trying to marry a sincere indie sensibility to a mainstream sentimental holiday-released excursion for families. 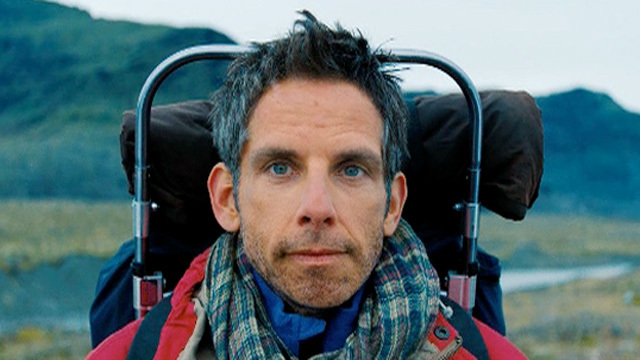 Stiller’s Walter Mitty never quite takes off. 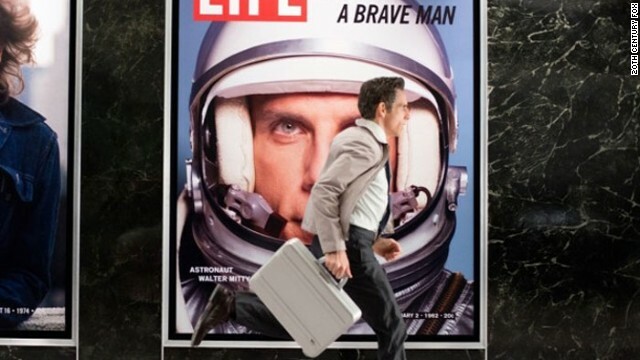 Walter Mitty (Ben Stiller) is a man who has trouble filling out an online profile. He doesn’t have too many experiences or places traveled. It may be why he frequently “zones out,” as his family terms it, escaping into fantastical daydreams. In real life he works as a photography assistant for LIFE magazine, a publication that is transitioning to a digital-only existence. The enigmatic photographer Sean (Sean Penn) has sent a collection of film negatives to Walter, making special note of how Negative #25 is his life’s masterpiece. However, Walter cannot find it and is having trouble getting in contact with Sean, who is overseas on assignment. Without that much-hyped negative/picture, Walter will surely be fired, and then he’ll never have a chance to ask out his co-worker, Cheryl (Kristen Wiig). Walter sets out to Iceland and beyond to find the negative, stop daydreaming and finally live his life. The very tone of the movie feels like a miscalculation. It’s the story of a daydreamer, a man who retreats into his head and lives out preferable fantasies that are whimsical and far-fetched. We all knew this going into the film. It’s the same as Thurber’s story. The problem is that when Walter gets the courage to embrace life, his life is full of whimsical and far-fetched moments. He jumps out of a helicopter in shark-infested waters, where the sharks are ravenously active. He also hops into a car and has to outrun an oncoming ash cloud from an exploding volcano. And then in the third act, he travels across a mountain range all by himself and manages to miraculously find one guy. I don’t think this approach works if his real-life adventures are on par with his whimsical fantasies. I suppose one could argue that this serves a point to make real life seem just as appealing as his mental retreats, but I think it harms the very execution of the movie. First, if there’s a parallel, it means that his fantasy sequences aren’t going to be too fantastic, squashing the potential of Walter’s imagination. The only fantasy I enjoyed was a Man of Steel-esque brawl with a bearded Adam Scott (TV’s Parks and Recreation). Secondly, it means that the serious “go get ‘em” message of the movie is occurring within a medium that ordinary citizens have little connection with. Make no mistake, Walter Mitty is clearly meant as a mainstream feature meant to inspire the masses with its sentimental stripes, but is the story of a superhero doing super deeds any more relatable to the common man? Another problem plaguing Mitty is the illusion of depth. Beyond the simplistic platitude of “get out and live your life,” there really isn’t much more of an idea explored here. It’s not like this idea hasn’t been explored in, oh, hundreds of other stories. Regardless, the film often just becomes a two-step process of Old Walter feeling timid, and then, what’s this, the hip soundtrack with the likes of Arcade Fire and Of Monsters and Men starts pulsating, and Mitty boldly shifts into New Walter, the go-getter, the guy who’s going to take charge of his own life. It’s a strong soundtrack in all senses. This process is repeated throughout the second act of the script where most of Mitty’s overseas journeys take place. Also, it may sound petty, but let’s focus for a moment on the applicability of the movie’s message compared to the practicality of what is onscreen. Live your life, but how many of us can afford to go globetrotting on a whim? I understand the larger canvas meant to evoke Mitty’s growing sense of discovery, so I’ll let it slide. The theme of Walter Mitty isn’t so much developed as it is repeated. There’s not enough substance here. In the end, the movie feels like 100 minutes of a soundtrack and a message in search of a better movie. Allow me illustrate one of those “go out and live, Walt” moments in the film. Walter is in Greenland (though filmed in Iceland) and needs to get to a fishing vessel. The man next to him is a helicopter pilot. Great. But he’s also drunk, so Walter understandably refuses to fly with the man. This seems like a very rationale decision, but then he fantasizes Cheryl coming through, urging him on through song (through song! ), and the soundtrack starts pumping, and Walter runs out and literally jumps inside the ascending helicopter. It’s meant to be portrayed as a triumphant moment of embracing the uncertainty of life’s adventure, but in reality the movie just pressured its title character into getting into a flying vehicle with a drunken pilot. What? That’s irresponsible. And then there’s just the lackluster characters and plotting. Walter Mitty is a nice enough guy but too milquetoast to be that appealing, relying upon the comic graces of Stiller to provide the filling. The character of Walter is basically a hodgepodge of other Stiller characters in previous movies, but the character feels too restrained for an actor of Stiller’s talent. I understand that the arc has to travel from passive to active, but it feels like the funny Stiller we’re all accustomed to is being held in check thanks to the film’s broad appeal feel-good sentimentality. There’s one brief moment of the anarchic, silly Stiller that we loved so much in Tropic Thunder, and it involves a weird fantasy where Walter suffers the reverse-aging Benjamin Button disorder. It doesn’t fit at all with the tone of the film, and that’s why it stands out. Walter is a nice guy but rather boring. He pins his journey of self-discovery on getting the girl, and then when presented with one minor obstacle at the start of Act Three, rather than speak with her, he assumes the worst and just gives up. The narrative requires one of those eleventh-hour misunderstandings to keep the guy and girl apart, but it’s a frustrating decision that makes me like Walter less. The Secret Life of Walter Mitty is also filled with blunt product placement and some strange plot elements that don’t blend together. I’m not generally offended by product placement in movies when they make it oblivious; hey, a character has to drink something so why not a (insert product here)? But the fact that the Walter Mitty team actually makes Water’s teenage stint at Papa John’s a reveal about his character, and that the very store is meant to stand in as a reminder of his own deceased father, is just wrong. Then there’s the fact that Walter works as a negative corrector (analog job) at a magazine (troubled industry), and that magazine happens to be LIFE (which shuttered in 2000). Why all the analog contexts? Is it meant to convey Walter’s reluctance to change or adapt? The whole notion of the magazine downsizing gives the film a real-life aspect that just doesn’t feel appropriate for the movie. The fact that Walter’s journey is propelled by a quest for a single missing negative feels a tad too facile for the man’s transformation, but it’s made worse when the answer to the location of the negative is so transparently obvious from the get-go. It was so obvious I almost talked myself out of it. Most of the supporting characters in the film serve little effect on any of the events. They’re there just to provide minor details about Walter and that’s it. 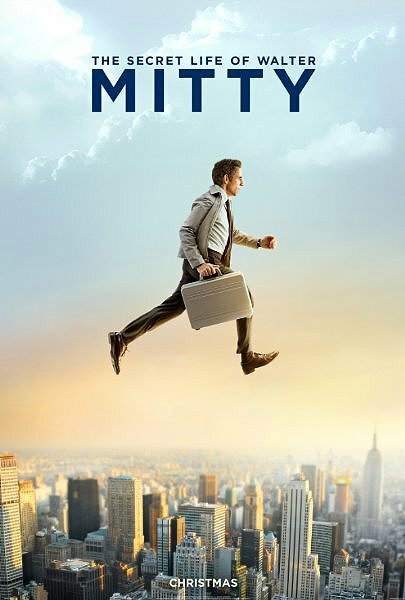 The movie is so earnest and you can tell Stiller is trying hard, but The Secret Life of Walter Mitty ends up being a disappointing feel-good message lacking substance and much entertainment. The filmmakers have conviction, I’ll give them that, but it’s misplaced, and the film’s tone has too many distracting elements. The fact that real life mirrors Walter’s fantasy visions seems like a miscalculation from the start. Thurber’s short story didn’t have that much to it to begin with but we need more than this, an office schlub learning to live his life through improbable adventures meant to inspire the rest of us common folk. As a slice of escapist entertainment, it’s not fanciful enough, not creative enough, and not funny enough. As a motivational, heart-tugging ode to living one’s life, it falls into too many traps to feel applicable, insightful, or engaging. It looks beautiful and the people behind the film obviously mean well, but good intentions and nice camerawork are not the same as an effective movie built from the ground up, namely the lackluster story and characters. The Secret Life of Walter Mitty feels like it has as much depth as a glossy, idealistic commercial, and perhaps for some this will suffice, but I found this Walter Mitty’s secret life not worth investigating. Posted on January 20, 2014, in 2013 Movies and tagged ben stiller, book, comedy, drama, fantasy, kristen wiig. Bookmark the permalink. 1 Comment. Nice review Nate. It’s a lot better than what I expected to see Stiller handle and for that, I had to give the dude some amount of credit. Maybe not all of the credit in the world, but definitely enough to where I can look forward to seeing what else he can handle behind the camera.